I can’t say enough about how cool I find this concept and how terrific the site is; please go check it out. Also, I love her designs and quite a few of them are on my radar. 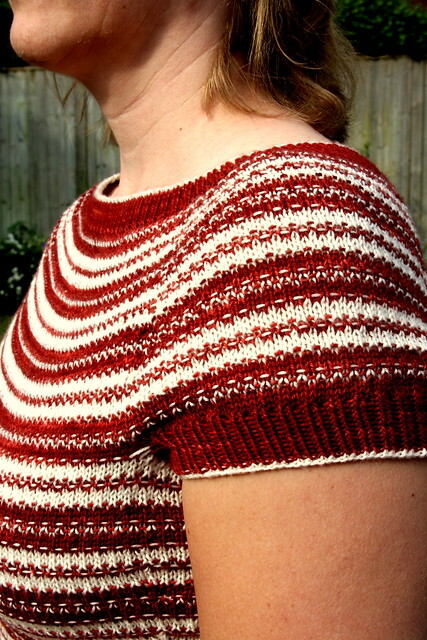 The Blakeslee Tee is the first of Emily’s designs that I have knit. It is also the first sweater that I ever knit in sock yarn. These photos are the ones that Emma took last year on the 1st of May, the day I finished knitting (as well as some progress shots while I was knitting). The pattern is very well-written and fun to knit. 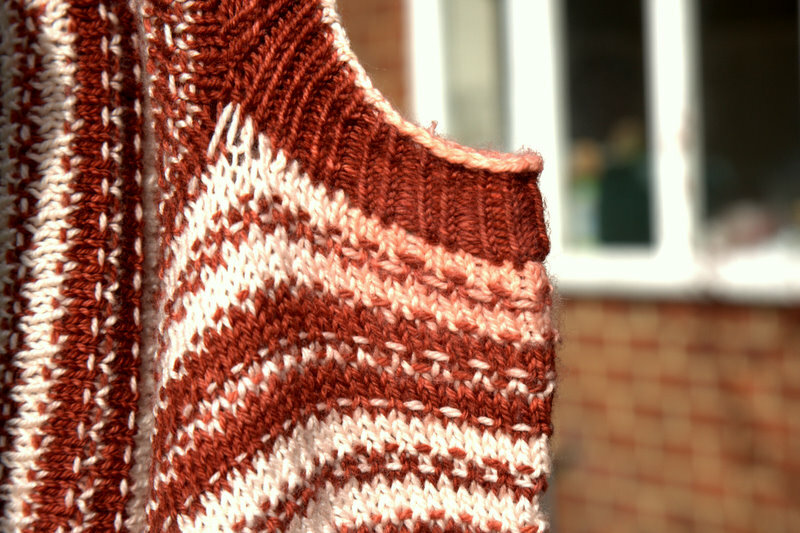 It is knit top-down, in the round, in a two-colour slip-stitch pattern. 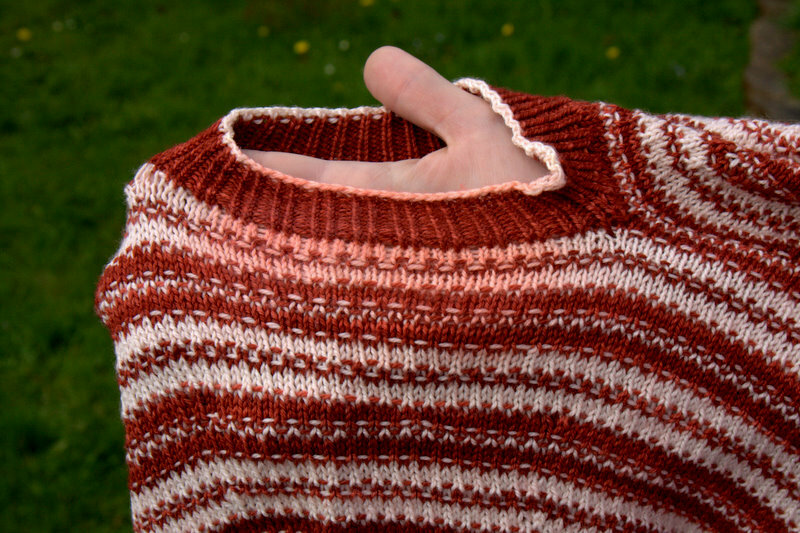 Interestingly, I knit the Blakeslee Tee shortly after finishing my Ormolu sweater, which is also a slip-stitch mosaic pattern, as is the Brick pullover which I just finished knitting for Doug. I seem to have been on something of a slip stitch bandwagon this year. As you can see, my Blakeslee Tee turned out perfectly. It fits great and is undeniably cute. It is an all around great summer Tee and a fun project. How many times have I worn it? Exactly once – on May 1st, 2011 when these photos were taken. Why, dear reader, you may ask, would I relegate such a great knit to the scrap pile? Here is a closeup shot of the underarm of the Tee, after having worn it for the 30 minute photo shoot. The Malabrigo sock yarn in Boticelli Red has run, turning the underarms pink. This is from wearing it for 30 minutes on a mild spring day. I wasn’t dancing in the sun and sweating profusely (though it shouldn’t have mattered if I were). The colour ran just from the contact of the sleeve and body. And before anyone jumps to point out the obvious, let me say that I did make a swatch – in fact, I made two, one knit flat and a much larger one knit in the round – and yes, I did wash and block the swatches. Needless to say, I was quite upset. I had heard many good things about Malabrigo sock. I have never used it before (or since for that matter), though I have used Malabrigo worsted and think it quite lush and luxurious. Looking back on it, perhaps I should have rinsed the whole skein in vinegar and made sure it wouldn’t run; then again, I did wash my swatches to no ill-effect. Or perhaps, the problem was trying to do any kind of colour work involving red. 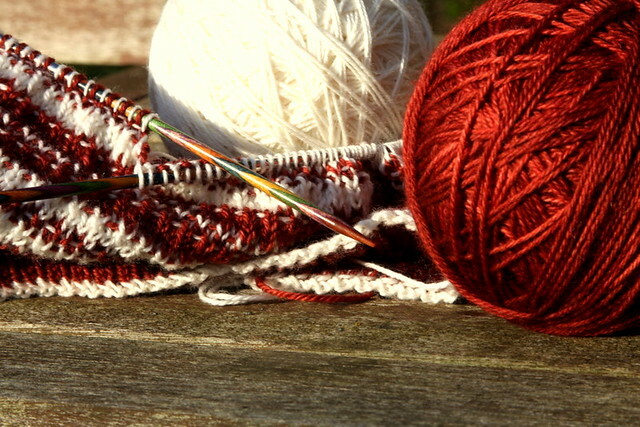 I used not only the recommended yarn but also the same colours as Emily used (Boticelli Red and Natural). If I were to knit this again, perhaps it would be better to choose navy instead of the red. It is also possible that this is not a general property of their red yarns but an unfortunate mistake with this dye lot (especially given that Emily knit her sample in this same colourway). I still haven’t decided what to do with my poor Blakeslee Tee; I have tried, to no avail, to get the red out. Maybe some kind reader has a remedy I haven’t thought of? I have also considered dying, but can’t think of any way to dye it which would work well; it is the contrast between the natural and red which was so appealing in the first place. This experience has made me much more cautious about colourwork, and hopefully it will work – as a cautionary tale should – and keep me vigilant about pre-preparing yarns in vibrant colours. It won’t keep me from trying out another Emily Johnson design however; I rather have my eye on Monami. And that concludes this Wearability Wednesday post, about an unfortunately unwearable sweater. This entry was posted in Main, Wearability Wednesday and tagged Blakeslee Tee, Emily Johnson, Family Trunk Project, Knitting, Malabrigo sock yarn by knitigatingcircumstances. Bookmark the permalink.